There is only one olive tree in the world that grows aeroponically and it is in Maremma. And its roots talk to us. Planted in the roof of a two hundred year old water cistern, that forms part of the ancient city wall that surrounds a quiet hill town in Tuscany, nestled along the slopes of an extinct volcano. The town is called Seggiano and its olive tree, the "Olivo nel Cisternone", is the largest plant in the world to be grown aeroponically. 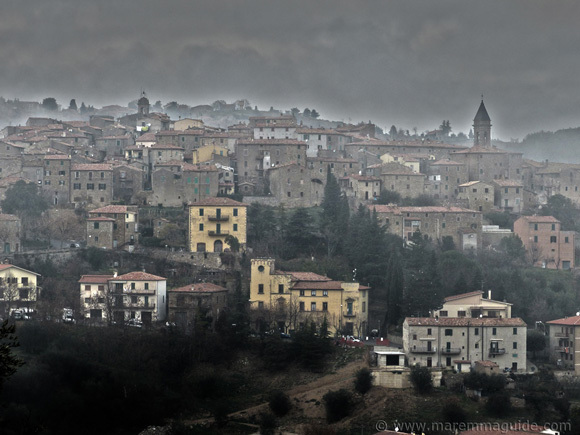 Seggiano in Maremma Tuscany on a winter's day. Never heard of aeroponics? It is "a plant-cultivation technique in which the roots hang suspended in the air while nutrient solution is delivered to them in the form of a fine mist." Oxford Dictionaries. 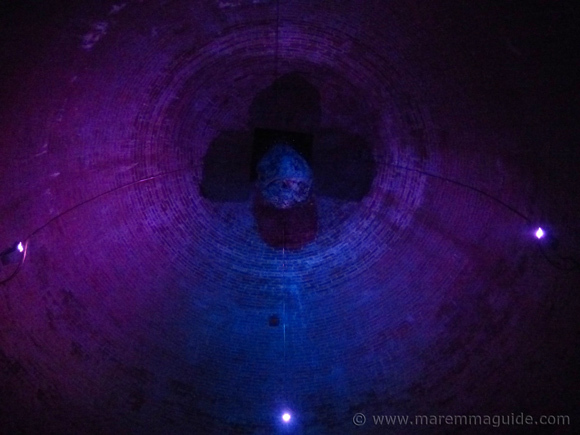 In Seggiano, inside the ancient cistern, water vapour droplets arrive at the roots of the olive tree naturally, through the evaporation of the water pool below. Aeroponic plants capture oxygen more efficiently, require less nutrients and water for their growth and are less susceptible to disease. Most examples around the world are in laboratories, or Tom Thumb lettuces and strawberries grown in greenhouses in the UK. But NASA funds a lot of aeroponic studies because man's visit to Mars will rely on it. And that olive tree happens to be one of kind in another sense: for it is an Olivastra Seggionese. A wild cultivar found only here on the slopes of Maremma's Monte Amiata mountain. But Seggiano's Olivo nel Cisternone is more than that. Because it is part of an incredibly fascinating and eye-opening study into the amazing intelligence of plants. Intelligence without "brains". The passing of intelligence and information via a network without loss of signal. Something which we as man are striving to develop even further for our own future. But which, in this case, is via roots: "le radice". And the roots of this particular olive tree talk. Don't you just love plants! 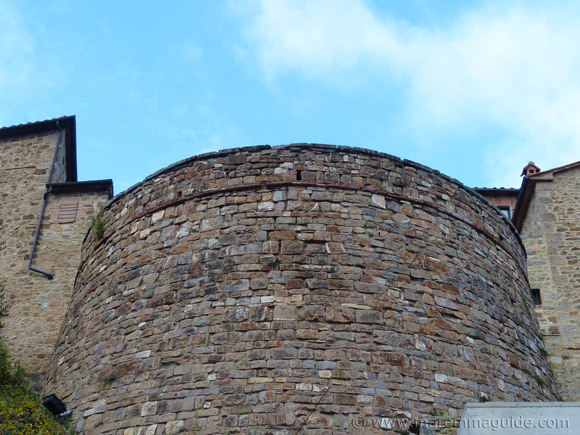 Take a walk along the quiet road that runs parallel with Seggiano's ancient city wall to the east - Via Armando Diaz - and, between small, tended, allotment plots to its left and right, this will be your view of the round "cisterna". Today, where once horses and carts passed by, children play and toddlers learn to cycle on tricycles with their dad's encouragement alongside. The door into the cistern is situated at the end of the dark passage you can see in the new concrete wall. Not the prettiest of entrances at the moment, but no doubt it will blend in better with its restored medieval and Renaissance surroundings over time. Once the door is opened, the depth of the darkness is momentarily blinding. The void is twelve metres high and echoes a lot! 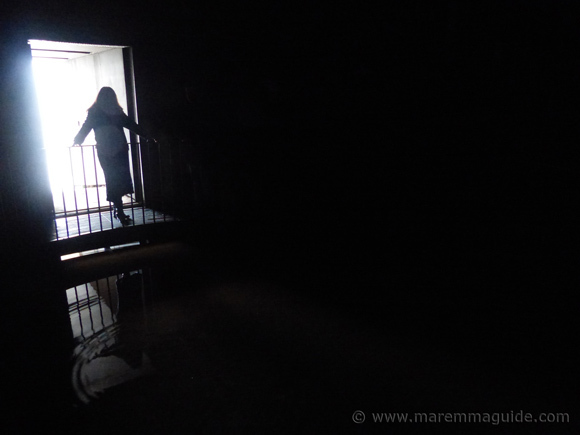 Attached to the walls above the water pool at its base - the levels of which vary depending upon the amount of local rainfall - is a metal grate path that you can walk around once your eyes have become accustomed to the dark. 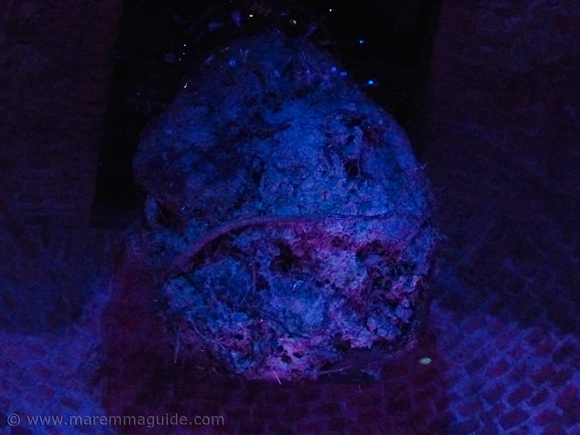 This "thing to see in Maremma" might not be the most captivating for very young children, but they won't forget quickly the "wobbles" they had about entering that dark space and walking above something they couldn't see! Looking up when the lights are turned on. I have lightened the photos so that you can see more of the detail. 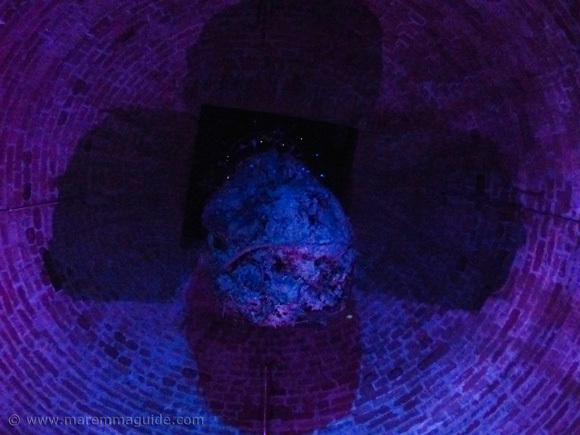 In reality the inside of the cistern is a much deeper and darker purple. Isn't it a gorgeous colour! All of the bricks used to build the cistern were baked curved. 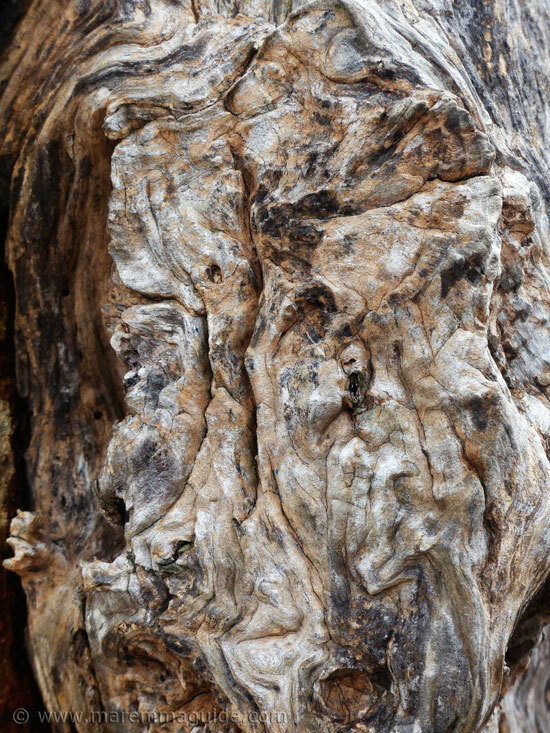 What looks like a huge walnut are the trees roots enclosed in metal netting. And those fine, wispy, white lines that you can see extruding from it are the ones that have ventured outside of the netting since it was planted. The lights are the sensors that send information about the electrical activity and movement of those roots to the receiver down by the entrance. When it is turned on - it wasn't during my visit - the machine "translates" that information into movements of a pen on a paper scroll, so that visitors can "see" the activity. How the olive tree is responding to the changes in its environment. Your presence. What scientists from the International Laboratory of Plant Neurobiology (LINV) within the University of Florence - partners in this amazing project - have discovered is that the olive tree responds continuously to changes in its environment; to the stresses of temperature changes and moisture levels. OK, you might say, I would expect it to. But what about roots "talking" to roots in other plants? Seggiano's olive tree also forms part of the Laboratory's wider study into the astonishing intelligence of plants; intelligence without a brain. In particular the role of roots in plant communication. An amazing thing. Take a look at what this controversial research is all about: what plants talk about! I bet you didn't know that hey had a rich social life! It's a wonderful video. Whilst I was writing this page I got "lost" for 50 minutes watching in awe. TIP: go make yourself a coffee first! 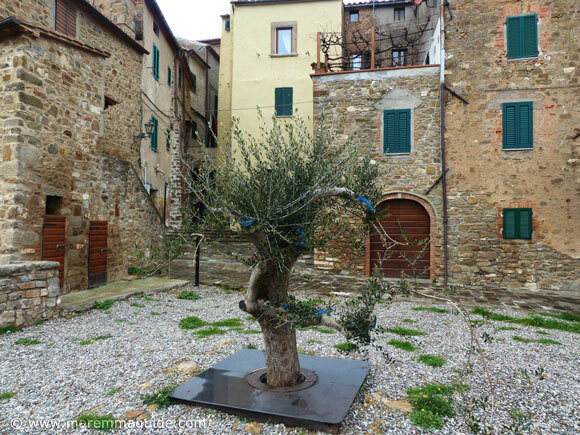 So where is the top of Seggiano's olive tree? 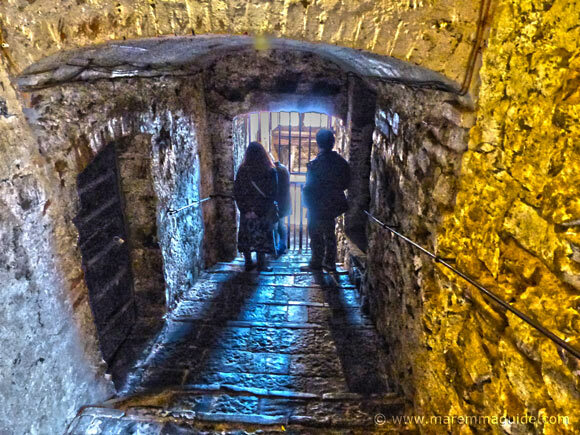 Well, you'll have to make your way up the path through Seggiano's "vecchia mura" - old city wall - to Piazzetta del Cisternone. In warmer months, this tiny piazza, with its medieval buildings as backdrop, is the scene for theatre performances, poem recitals and storytelling. Looking down to the Piazzetta with its view of the church, the Chiesa della Madonna della Carita’. 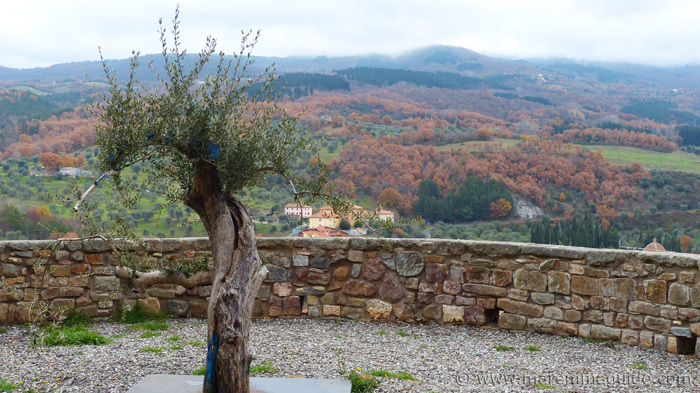 The olive tree's view of Monte Amiata on a December day. The bright blue tags that you can see are sensors. The Olivo nel Cisternone's size belies its age: it is over 75 years old. The olive groves here along the slopes of Monte Amiata date back to Etruscan times. And the Olivastra, descended from the wild Olea Europea Sylvestris olive, has survived throughout those twenty-eight centuries. Hard, snow covered winters and all. Monte Amiata is Maremma's winter ski destination. That it can survive very low temperatures means that it is rarely infected by olive tree parasites that can't. And the olive fly that bothers other Tuscan trees in the summer and autumn gives it a wide berth. The trees around Seggiano, therefore, do not need to be sprayed each year. 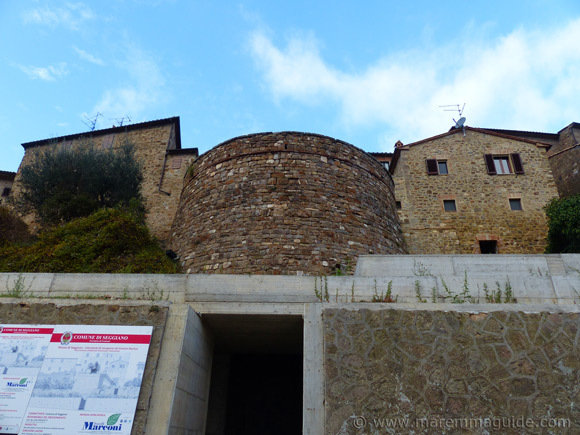 The Olivastra di Seggiano is also known locally as Seggianese, Seggianina, Olivastra di Montalcino, and the Olivo dell'Amiata. The Olivastra doesn't grow anywhere else: like most Maremman's, it doesn't like to be away from home! It's preferred ground is at an altitude much higher than other olive trees can bear, between 350 and 650 metres above sea level, on the north-western Amiata foothill. Surrounded by Amiata chestnut trees. It's fruits mature much earlier and are much smaller than the olives of other varieties, but produce a high yield of a very particular oil. An oil that has an extraordinary phenol - antioxidant - content and an extremely low level of acidity. The controls around what can be called Olivastra Seggianese Extra Virgin olive il DOP are tough, very tough. Only oil produced from the 130,000 registered centuries old trees in the Olivastra Seggianese olive groves around the towns of Arcidosso, Castel del Piano, Cinigiano, Roccalbegna, Santa Fiora, Seggiano and Semproniano, and part of the territory of Castell'Azzura, may be called Olivastra Seggianese. Some of those trees are a 1000 years old. Can you imagine that? When you are drizzling Seggiano's olive oil over your bruschetta, it has come from the same trees that produced oil when the Kingdom of England and the Holy Roman Empire were established! And only those oils with a minimum of 85% of Olivastra Seggionese mixed with other local Tuscan varieties, may carry the DOP name. It probably won't come as a surprise to learn that the special environment of Monte Amiata - known locally as the "enchanted mountain" - it's volcanic soil, the micro climate of its slopes, combined with this indigenous cultivar of olive tree, results in an olive oil with its own unique flavour and aroma. Every extra virgin olive oil I have ever tasted in Tuscany - and I have tasted a lot! - including our own small production from the trees in our garden, has a wonderfully robust, strong peppery flavour, with a powerful "pizzicore" aftertaste. A tickling in the mouth and throat similar to "pepperoncino" (chilli). The Olivastra oil I tasted is quite different. It is a delicate, light, soft rounded oil. And any "pizzicore" is only a fleeting one that melts away as quickly as it arrived. More of a golden yellow than the bright green of my local variety, it looks different too. 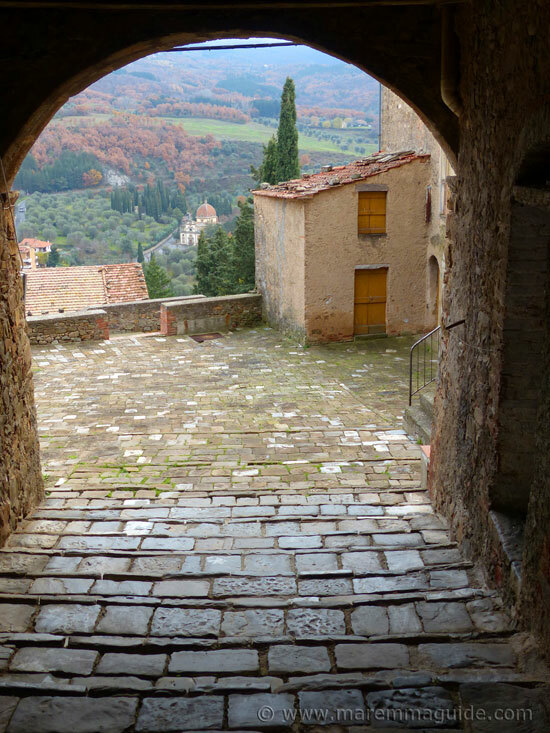 Access to the Olivo nel Cisternone is restricted - in the sense that its door isn't open to the public - but it is easy to arrange to see it. And in doing so, you'll also get to see behind Seggiano's two other doors that you won't want to miss either. The guided tour of the cistern forms part of a tour of the historic centre of the town run by a local consortium that was recently founded to promote the town, its agriculture and products. It's a great way to spend a couple of hours and you take in some olive oil tasting too - after all when in Rome... And Seggiano's extra virgin olive oil is ranked as one of the very finest in the world. The members of the consortium are growers too, and know their stuff: you'll get to find out a lot about the production of the oil and the nuances of each farm's oil: there is variety even on the same volcanic slopes. You won't leave as an EVOO Sommelier, but you will certainly leave knowing a lot more about Maremma's olive oil than before you arrived. You can find the tour information, opening times, and ticket prices here. Have fun!